With New Year celebrations freshly on our minds many photographers are starting to share their firework images from celebrations around the world. 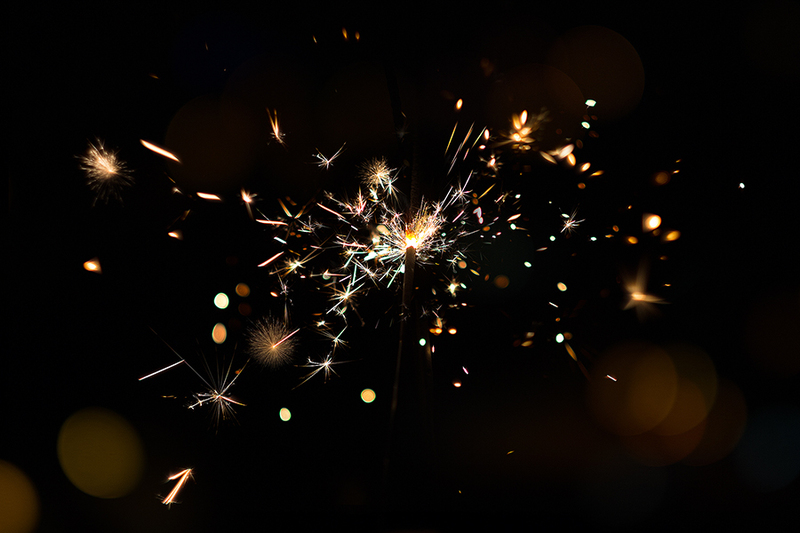 No one wants to be left out when it comes to sharing, so what should you do if you didn’t manage to capture any fireworks? The answer create your own. 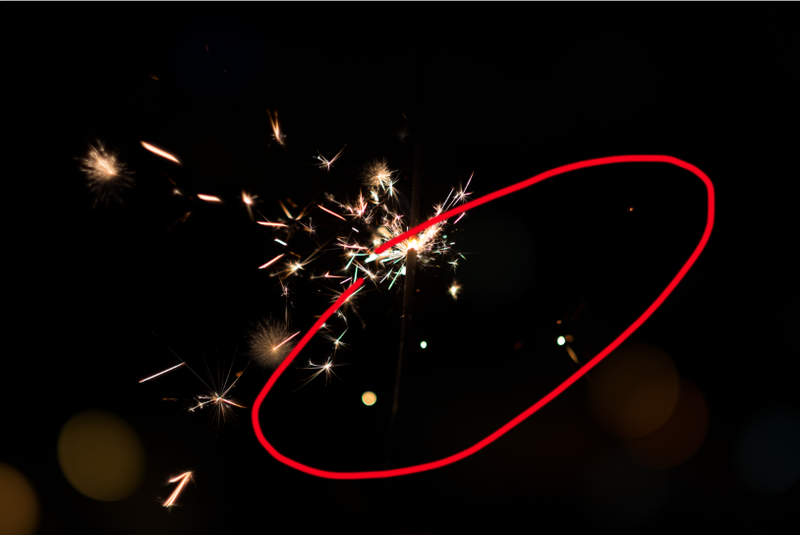 In this article I’ll take you thought the process I used to create this simple firework alternate image shown above. But first here’s a bit of the background behind the image. The photograph is of a sparkler captured around an arm’s length away from the camera. The handheld camera settings used were ISO 200, 84mm (35mm equivalent), f1.2 at 1/300 second. A total of 9 photos were used to make this image. Start by opening your base photo containing the most sparks from the sparkler. Then open all of the other images you have taken ensuring you have the same focus point in each photo. Cut and paste all of the photos as layers on the original photo. 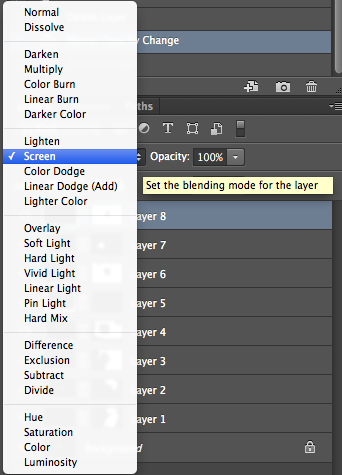 Click on each of the new layers and change the blending mode to ‘Screen’. This will then only reveal the light details in each of the layers and hide the dark areas. 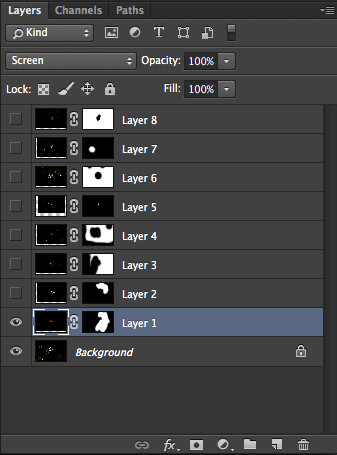 Now select Layer 1 and then press the Layer Mask button. 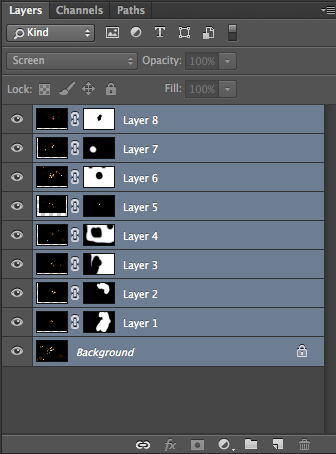 You can see from the screenshot below I’ve done this for each individual layer. I’ve already painted on each of the layer masks as explained in the following steps. 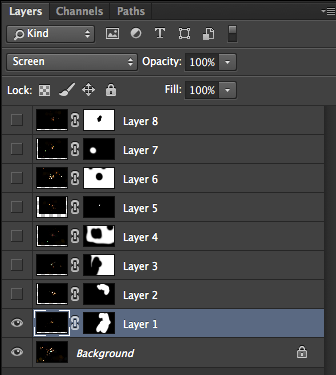 It’s at this point you need to understand a little bit about layer masks. What they essentially do is hide or reveal what lies beneath a layer. In the real world think of them as windows. Paint the window black and you won’t be able to see anything, however if you keep the window clear (which is represented as white on the layer mask in Photoshop) then you will be able to see through it to the next layer which sits beneath the layer you are painting on. Now that you understand the real world analogy select the brush tool and change the Opacity and Flow of the brush to 100%. Now click on the layer mask on Layer 1. In this case the layer mask is actually the colour black. So going back to our real world analogy you won’t be able to see anything through it. In order to reveal what lies beneath the darkened window you will need to select a white brush (remember that clear window) to paint on the Layer Mask. You can see in the first example below I’ve already painted a white patch on the black Layer Mask. As shown in the image above the opposite would be if you were to have a white layer mask, you would need a paint with a black brush to hide parts of the layer. 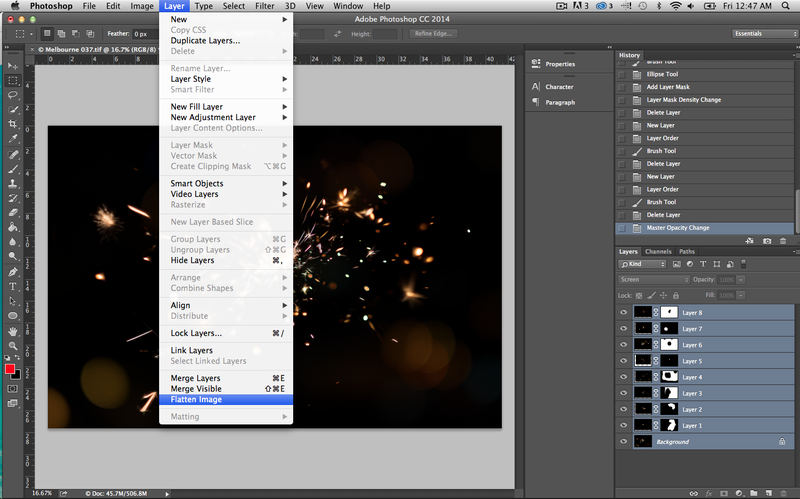 You may ask why there are two types of layer masks? Black and White as shown in the screenshot? What the? Well it’s simple, sometimes you may want to hide an entire layer and only reveal a little bit and other times you may want to reveal an entire layer and hide certain parts of it. You can change what type of layer mask you want by either holding down the command key (or alt on a PC) and pressing the layer mask button, which will give you a black Layer Mask, which will hide everything. Clicking the layer mask button without holding down a key will give you a white layer mask, which will reveal everything. Okay so now that we’ve got layer masks all sorted all you need to do is select the image layer you want and click on the layer mask. In the case below I’ve selected Layer 1. You can see that it’s a black layer mask so I’ve used a white brush to paint and reveal the parts of the image I would like to include with the background layer. The image shown below shows the area I’ve painted, which corresponds to the layer mask. Now where building up the image one layer at a time. 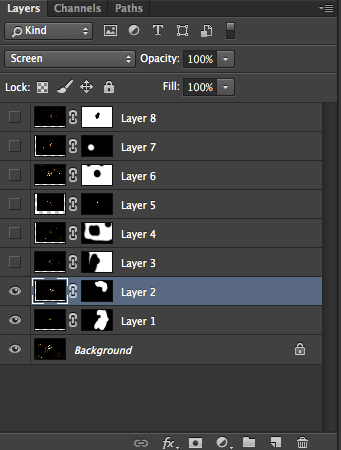 The next step is to select Layer 2 and then click on Layer 2’s Layer Mask. As shown in the photo below I painted with a white brush to reveal what sparks I wanted to include in the final image. Now all I need to do is do the same to each layer mask. 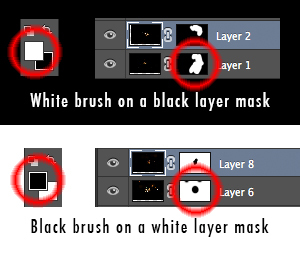 If you’re attempting to do the same make sure you select the correct brush for the layer mask. Another way of remembering is to select the opposite colour brush to the layer mask, ie white brush for black Layer Mask. The final result I came up with once every layer mask was painted is shown below. To save your image once you’re happy with it select all the layers by holding down the shift key then click on the Background Layer followed by clicking on the highest layer. It’s at this point you can release the shift key. All the layers should then be highlighted. Navigate to the layer menu and click on Flatten Image. This will then crunch all of the layers into one background layer. Now all you need to do is save it. So there you go, if you don’t happen to have fireworks near you, you can create your own with a bit of imagination and for not much cost.